WW1 Reenactments Equipment : Great War Tommy WW1 Food Rations Labels : New Zealand Army Ration tin label. WW1 Reproductions and WW1 Reenactors Equipment / Kit - New Zealand Army Ration tin label. New Zealand Army Ration tin label. 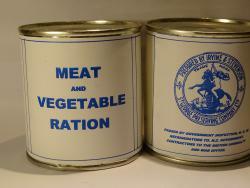 A bit conjectural, based on Irvine & Stevenson's "St George" brand WW2 MEAT & VEGETABLE RATION. During WW1 I & S were contractors to the British Admiralty and War Office, as well as refrigerators to the N.Z. Government. Label fits Cond' milk cans.